Archbishop Desmond Tutu has voiced his support for including homosexuals in the church, in an address to the Kirk’s General Assembly in Edinburgh. The South African archbishop insisted every kind of person, no matter what their race, class or sexuality was part of God’s family. Earlier this week the Church of Scotland agreed a two-year moratorium on the ordination of gay ministers. The decision came after the appointment of a gay minister in Aberdeen. On Saturday, the General Assembly, the Kirk’s supreme court, said the Reverend Scott Rennie could become the minister at Queen’s Cross Church. The minister said he was open about living with his male partner and his appointment was backed by a majority of the congregation. The General Assembly’s decision to appoint Mr Rennie – in a 326-267 vote – raised fears among traditionalists of a possible split in the Kirk. But on Monday, a two-year ban on the ordination of gay ministers was announced while a special commission considered the matter and reported back in 2011. The Archbishop said he was aware of the debate over whether the body would agree to endorse the gay minister’s appointment, adding that “mercifully” this was done. He said: “For my part, I was involved in the struggle against a system that penalised people for something about which they could do nothing – their race – and I could not stand by when people were being penalised again for something about which they could do nothing – their gender. “For quite a while our church did not ordain women to the priesthood. I joined the struggle and this is a non-issue in our church now. We haven’t yet consecrated a woman bishop but we’ve called our first woman Dean and any number of women are Archdeacons. 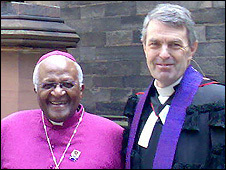 As well as advocating the inclusion of all kinds of people in the church, Archbishop Tutu argued vociferously for an end to poverty. He questioned how obscene amounts of money could be spent on weapons when only a tiny fraction of defence budgets would feed the hungry. The archbishop received a standing ovation before departing for Edinburgh University where he was awarded an honorary degree. This entry was posted on Thursday, May 28th, 2009 at 6:07 am	and is filed under Uncategorized. You can follow any responses to this entry through the RSS 2.0 feed. You can leave a response, or trackback from your own site. Anglican Mainstream is a community within the Anglican Communion committed to promote, teach and maintain the Scriptural truths on which the Anglican Church was founded. These also guarantee its fellowship with Christians down history and throughout the world. Faithfulness to Scripture as God's Word is essential for sharing the love and purpose of God in Jesus Christ. Bible Human Rights and AIDS. 2011 confernce. July 2009 Gay unions and blessings. Why have a Fellowship of Confessing Anglicans in South Africa? Anglican Mainstream South Africa is proudly powered by WordPress and the Simplicity theme.